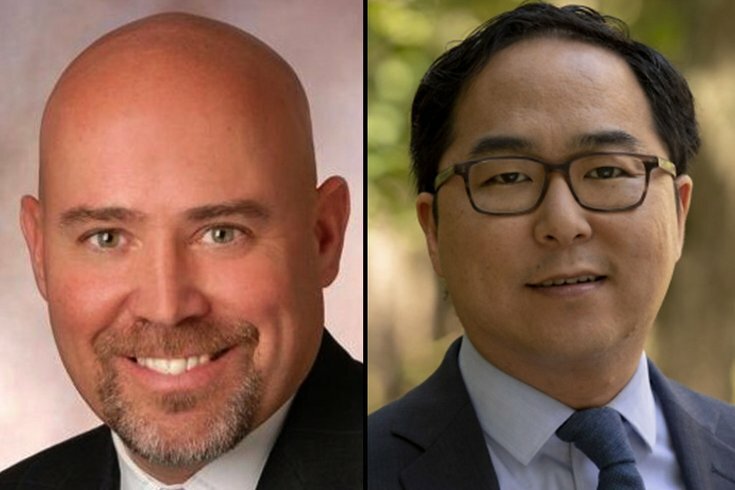 The District 3 congressional race between Republican incumbent Tom MacArthur, left, and Democrat Andy Kim, right, will be decided by no more than a few thousand votes. Going into Election Day, the race between Republican incumbent Tom MacArthur and Democrat Andy Kim was considered a toss-up. By the time voters in the 3rd Congressional District, which covers 52 municipalities in Burlington and Ocean counties, had their say, it remained too close to call. With 99 percent of the vote counted, MacArthur led Kim by fewer than 2,500 votes, with Kim carrying his home Burlington County by 19 percent and MacArthur winning his home Ocean County by 23 percent of the vote, according to unofficial tallies. MacArthur, a 58-year-old from Toms River who won a second term by 20 percentage points in 2016, has voted along with President Donald Trump an estimated 95 percent of the time. He touted his efforts to repeal Obamacare in favor of a plan to curtail Medicare expansion in the state. Kim, a national security expert from Marlton, served as a strategic adviser to Gens. David Petraus and John Allen in the Afghanistan War. He would be the first Democrat in Congress of Korean descent. The MacArthur/Kim race was not the only U.S. House seat up for grabs in South Jersey. In the 1st Congressional District – which covers 52 municipalities in Burlington, Camden and Gloucester counties – incumbent Donald W. Norcross of Camden cruised to an easy victory over Republican Paul E. Dilks of Turnersville. Norcross, 59, an electrician by trade and a former labor leader, will serve his third term in Washington after having served four years as a state assemblyman and senator. With 75 percent of the vote in, Norcross was declared winner, leading Dilks by about 30 percent of the vote (64 to 33.6 percent), according to unofficial tallies. "I am humbled by and thankful for the thousands of South Jersey working families, seniors, veterans and students who voted for me today," Norcross said. "It's been my life's work to fight for them, and the fight continues." The open race to represent the 2nd Congressional District – which includes 92 municipalities in Atlantic, Burlington, Camden, Cape May, Cumberland, Gloucester, Ocean and Salem counties – pitted Democrat Jeff Van Drew of Cape May Court House against Republican Seth Grossman of Atlantic City. Van Drew, a dentist labeled one of the state’s most conservative Democrats, declared victory over Grossman, another unabashed supporter of President Donald Trump and his agenda. Leading by just one percent of the vote around 10 p.m., Van Drew declared victory and said he'd take the stage to thank supporters about a half hour later. But the race was still tight around 11 p.m., with Van Drew leading by 2.6 percent with 71 percent of precincts reporting, according to unofficial tallies. The race featured no incumbent as current U.S. Rep. Frank LoBiondo will retire at the end of his term. LoBiondo had represented the district since 1995. If it holds, Van Drew's victory would mark the first Congressional seat in South Jersey to flip from Republican to Democrat. Republican incumbent Chris Smith has represented the 4th Congressional District – which covers 40 municipalities in Burlington, Mercer, Monmouth and Ocean counties – since 1981. AP called the race for him at 9:13 p.m. with about 56 percent of the vote with 70 percent of the votes in, according to unofficial tallies. He defeated Democrat Josh Welle and Libertarian Michael Rufo. The 5th State Assembly District – which includes parts of Camden and Gloucester counties including the city of Camden – featured a special election between Republican challenger Nicholas Kush and William W. Spearman, the Democratic incumbent who was appointed to the seat in June following the resignation of Arthur Barclay. With 75 percent counted, Spearman led Kush, a retired Teamster from Runnemede and father of a well-known GOP political consultant, with 65 percent of the vote, according to unofficial tallies. New Jersey voters statewide also were asked to weigh in on the "Security our Children's Future Bond Act" which sought authorization for the State to issue bonds in the aggregate principal amount of $500 million. With 92 percent of precincts reporting, 52.1 percent of voters supported the measure, according to unofficial tallies.